In four years of working with Cindy Gass, the Reves Center’s Director of Financial Operations, she had never said that about anyone. She had just met with Louise Ndiaye, the new Sponsored Program Administrator assigned to the Reves Center. 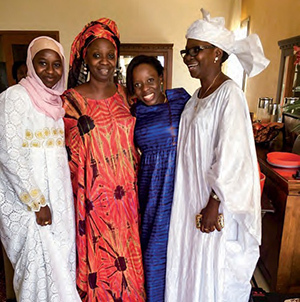 Since Ndiaye assumed the position only in late July, Gass invited her to Reves to introduce her to the office and programs before the semester started. With such a ringing – and rare – endorsement, a trip across town was definitely in order. The Office of Sponsored Programs (OSP) lives in a two-story building on Mt. Vernon Avenue. Although the office understated and nondescript on the outside, the work that goes on inside is key to the research mission of the university. Ndiaye is responsible for several other departments as well as Reves, from Anthropology, Kinesiology and the Charles Center, to Public Policy and Theatre, Speech & Dance, to name just a few. For the Reves Center, Ndiaye currently man- ages the grant for the W&M Confucius Institute, which means she works with Gass to prepare financial reports and ensure compliance. Ndiaye began her career working in finance and banking in Paris. After marrying, she moved to the U.S. and worked in the New York of the bank in Paris. Her husband’s career U.S. military brought them to Virginia in late 2005. She worked at the Jamestown-Yorktown Foundation and Thomas Nelson Community College in Hampton. In 2011 they were stationed in Japan. She loved their three years there, traveling all across Southeast Asia.